Looking for some spine-tingling camp horror? Well, just in time for Hallowe’en, Snakehead Swamp is available on DVD. A horrifying hybrid of genetic science and nature has taken over the Louisiana bayou, leaving terror in its wake! In the heat of the summer, what began as a day of boating and bikinis changes drastically when a school of genetically enhanced snakehead fish finds its way into Black Briar Swamp. As their thirst for blood grows, the creatures evolve by the minute, even learning to walk on land! No one is safe in this hair-raising thriller. The film will be available on DVD and Digital HD October 7, 2014, from Sony Pictures Home Entertainment. The follow-up to Syfy’s camp classic Snakehead Terror stars Ayla Kell (TV’s “Make It or Break It”) and Dave Davis (TV’s “True Detective”) with Terri Garber (TV’s “As the World Turns,” “Dynasty”) and Antonio Fargas (TV’s “Everybody Hates Chris,” “Starsky & Hutch”). SNAKEHEAD SWAMP is directed by Don E. Fauntleroy from a screenplay by Greg Mitchell. Ken Badish and Daniel Lewis served as both producers and executive producers with Eric M. Davies as line producer. SNAKEHEAD SWAMP originally aired June 28, 2014, on Syfy. The film has a run time of approximately 86 minutes and is not rated. Yep. Snakehead Swamp was written by my friend, author Greg Mitchell — that same cat who lent his name to the late, great monster hunting occult detective who appeared far too briefly in my short story CABIN IN THE WOODS. So do him and yourself a favor, pick up a copy of Snakehead Swamp for Hallowe’en. Welcome my good friend, Greg Mitchell, to the Occult Detective. Greg and I met through The Midnight Diner, a neat little anthology that we both contributed to a few years back. Greg and I bonded over a mutual appreciation of each others writing and our love and fascination for those things that go bump in the night. Having read Greg’s debut novel, The Strange Man, I can assure you that he knows a thing or two about what scares folk. He invokes a sense of dread, conjuring up the very essence of evil and foreboding doom like few others. With that being said, it is my pleasure to turn over the reins to him today as he shares with you what being scared is all about. On the contrary, I hate being scared. As I write this, a tornado warning has just been lifted off our small Arkansas town. My wife and two little daughters were huddled in the bathroom, praying that, should a touchdown occur, it’d pass us by. For half an hour, I watched the weather report, pacing between every window in the house, looking for signs of a funnel cloud. I was scared and I didn’t like it. Growing up, I was pretty much scared of everything—other kids at school, finishing my homework on time, meeting new people, going new places, and reaching adulthood period. Where did I find solace for my fears? Well, my faith, certainly. Since I was about eight, I have relied on God as I’ve understood Him through the Bible, and that’s taken me through life’s darkest hours. But, perhaps ironically to some, the other place I have found warm security is in horror movies. Ghost stories told around a flashlight. Books on urban legends, checked out from my school library. I often found peace in the world of the macabre, because here I could face my fear head-on and survive. The same can be said of me today, at age thirty-two. I still love monster movies. They still ease my fears and remind me of simpler times. Of fighting off childhood bogeymen. Being so afraid, it’s no surprise that the characters I gravitated towards in my favorite movies and stories were the monster hunters. Those greater than myself who could protect me should a werewolf or Phantasm’s Tall Man darken my door. Van Helsing (Edward Van Sloan, not Hugh Jackman), the Frog Brothers from The Lost Boys, Fright Night’s Peter Vincent, or Michael Myers’ nemesis Doctor Sam Loomis. Or perhaps most of all, my greatest childhood heroes—The Real Ghostbusters (yes, I watched the cartoon before the movie. Sue me, I was young), and The Monster Squad. My fondest summer as a boy was spent watching The Monster Squad nearly every single day before rushing outside with my neighborhood chums. We’d assign roles—I insisted on being Rudy—and do battle with invisible hellish beasts. We’d draw maps, form tactics, and bike pedal to the local library to do long hours (probably just thirty minutes) of research on the best ways to kill a vampire, or what Freddy Krueger’s weaknesses were (I settled on fire). We investigated neighborhood houses we believed to be haunted (you’d really think our block was sitting on a Hellmouth, by how many “discoveries” we made), and we kept each other in the loop when rumors surfaced of a local Bigfoot sighting. We had our own little Monster Squad and I’ll never forget it. Looking back, it was a powerful experience for me as a ten/eleven-year-old boy. I found my courage, tested my wits, and, best of all, faced my fears. Those were scary times—we often convinced ourselves of supernatural happenings and, while it was nothing but children’s overactive imaginations, it was real to us. To me. And I fought it. I was a monster hunter. Writing, these days, is about recapturing that fearlessness of my youth. About lassoing my deepest fears of the Bogeyman and binding him to the printed page—and then fighting him. 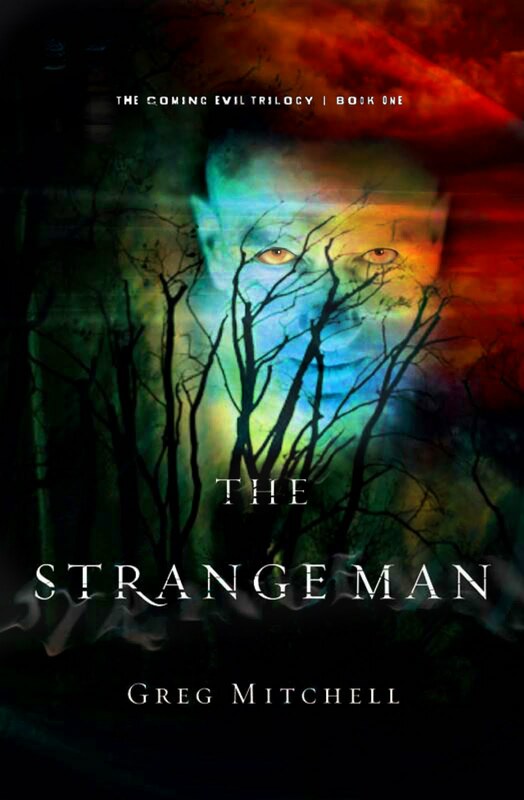 My novel The Strange Man is one such tale, the first of a trilogy about ordinary people learning how to be heroes. How to fight devils. It’s about coming of age and finding the strength to face our demons. It’s about faith, God, doubt, regret—but at the heart of it all it’s about me, still a boy looking for monsters in the dark places, ready to drive them back with the light of day. ABOUT THE STRANGE MAN: Dras Weldon lives in a world of horror movies and comic books. Twenty-two and unemployed, he is content to hide in the shadow of adolescence with a faith that he professes but rarely puts into action. But when a demonic stranger arrives and begins threatening his friends, Dras is drawn into a battle that forces him to choose which side he is on. In a race against the clock, he must not only fight these evil forces but also somehow convince his best friend, Rosalyn, to join him–before she is lost forever. What better way to begin Bobtoberfest than with my being interviewed by the illustrious Greg Mitchell over at The Coming Evil? Greg’s a great guy, a talented writer, and a kindred spirit — and he had the honor of being ceremoniously dispatched in The Cabin in the Woods, available here or within the pages of my novel Descendant. Greg and I shared a common publication in Coach’s Midnight Diner 2: The Back from the Dead Edition — he with Flowers for Shelly, me with Queen’s Gambit — and came away with a respect for each others writing. It was a real honour and privilege to sit down and discuss the genre with a writer I admire. I think you’ll find the interview insightful, primarily due to Greg’s thoughtful questions. As to what’s in store as Bobtoberfest continues? In the days ahead you can expect a plethora of Weiser book reviews, some spine-tingling artwork culled directly from my drawing board, and a whole host of true stories of the paranormal to rear their ugly heads — and beginning 10-10-10 — the first installment of a serialized tale written exclusively for the readers of The Occult Detective. As always when I embark on such an endeavor, this serial will be written free-style, with me typing directly onto the blog without any notes or outlines. We’ll discover where the story leads together. So raise your flagon and toast to the first day of Bobtoberfest. ‘Tis the Witching Season and All Hallow’s Eve beckons.